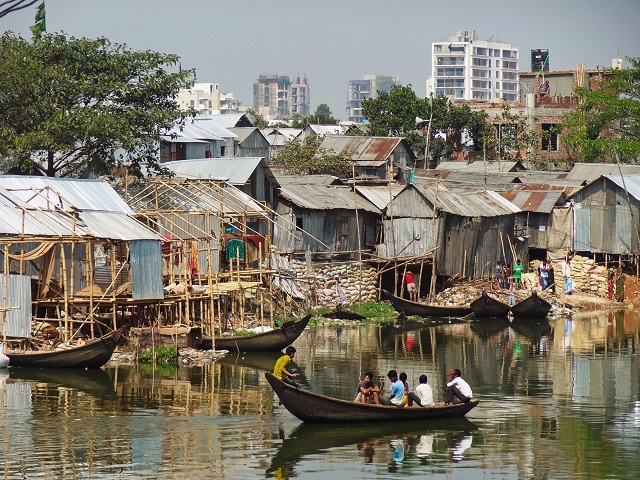 Although living in a region full of rivers, residents of Korail—an informal settlement in Dhaka, Bangladesh—often struggle to access clean water and other basic urban services. Photo by William Veerbeek/Flickr. Twenty million people live in Dhaka, Bangladesh—one of the fast growing cities in the world. But with the equivalent of $5.4 billion in GDP susceptible to damage from river flooding alone, the country is also one of the most vulnerable to climate change. This video of the Korail settlement in Dhaka explores the informal community’s vital relationship to water—the traders who cross the city’s myriad rivers daily, the women who rely on rainwater for cooking, and the children who wash themselves in muddy pools of water collecting on the streets. When talking about the challenges and opportunities of urbanization, it can be hard to move beyond the prodigious scale of global growth and investment to imagine what it all looks like at a more human level. This video of the Heliopolis neighborhood of São Paulo depicts development from a different perspective, focusing on the incremental changes that happen to the urban landscape every day, every hour, every minute. Watch a few local construction workers mix concrete in the street and apply it, brick by brick, to a new building slowly encroaching on the street. Visualize expansion in real time, as it’s experienced. Watch the rest on vimeo.